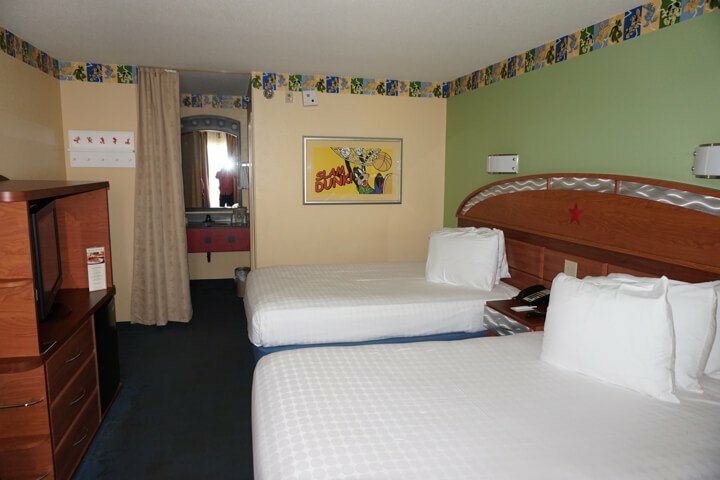 In this review of Disney’s All-Star Sports Resort, Jenn from Will Save For Travel , introduces us to one of the very first Disney Value Resorts on property. There are three Disney All-Star Resorts on Disney property. All-Star Sports is the oldest of all the Disney Value Resorts. However, If Disney immersion and theming, larger than life icons, and value friendly rates are what you need, then All Star Sports really hits a home run. 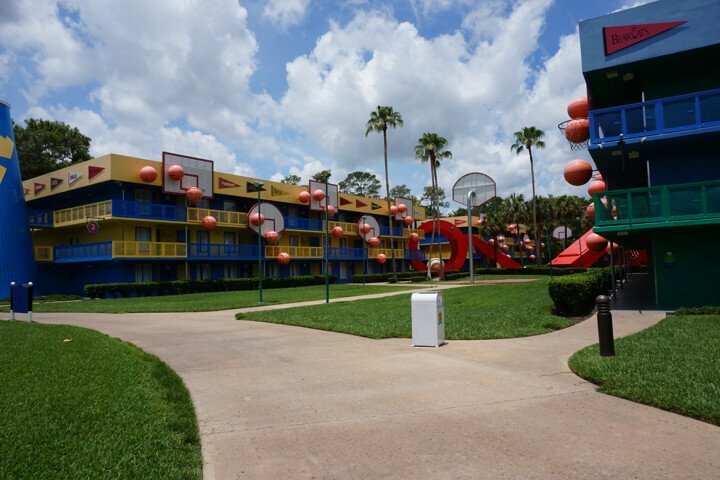 Disney’s All-Star Sports is one of the three original Value Resorts located on Disney property. Closest to the Animal Kingdom, they are a cost-effective way to stay on property to get the immersive Disney experience! The resort is made up of several buildings: one main building and 10 room buildings, all themed with different sports. 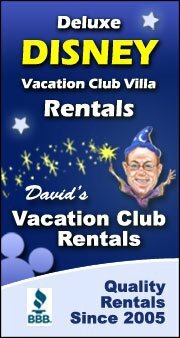 The value resorts are the most affordable places to stay on Disney property. The price varies depending on if it’s high or low season but you can expect it to cost around $100- $185 a night. We recommend Under Cover Tourist for great discounts on Disney Resort Hotels! Here are even more tips to help you save at Disney Resorts. We stayed in a Standard room, at the back of the resort in the Hoops section. It was a bit of a walk from our room to the main building but we didn’t mind, it took about 5 minutes and it was fairly quiet at night. The preferred rooms are closer to the main building and pool, and come with a slightly higher price tag. The rooms fit 4 people but are quite small at 260sqft, they have 2 double beds. The resort was clean and each room has a small table, a TV, a mini fridge, iron and ironing board and small safe. We were comfortable as 2 adults in the room, but it could get crowded with 4! Disney’s All-Star Sports Preferred rooms are located in the buildings closest to the Stadium Hall (lobby) and the End Zone food court. INSIDER TIP: If you are family larger than 4, the price for two value resort rooms may be greater than for a larger moderate resort room. Some moderates accommodate up to 5 people utilizing a pull-down Murphy bed. *One thing to note is there is no coffee pot in the Value Resorts. Many people purchase a small one to bring with them or have it delivered via Amazon prior to your arrival. The only way from the All Star Sports to the Disney Parks is by bus. The buses run often and pick you up in front of the main building. For the most part the All Star Sports has a dedicated bus, but sometimes during slow periods during the day it shares a bus with the All Star Music and All Star Movies. We had no problems with the bus system but when you’re traveling at peak times there can be a long wait, especially going back to the resort from the parks at closing time. There is also free parking onsite if you’d rather drive yourself to the parks. The main building at the front houses the End Zone food court, which serves only quick service meals and snacks. One of the downfalls of the Value Resorts is there isn’t a table service restaurant. The food court does have many options and is open for breakfast, lunch and dinner. You can also get pizza delivered to your room. We usually grab something to go in the mornings, as it can be quite busy at peak times. For some great ideas on how to have a “No Park Day” at Disney Resort’s check out Will Save For Travel. There are two pools, the main Surfboard Bay Pool, and the smaller Grand Slam pool, neither has a waterslide or hot tub. The bar at the main pool serves alcoholic drinks and some food. There is an arcade and a shop to buy your souvenirs and necessities. There’s also a short jogging trail that we used on our last stay. We also enjoyed getting our caricature drawn in the lobby! Beat our annual price rise and lock in our lowest prices! Orlando Theme Park Tickets – which ticket is right for me? 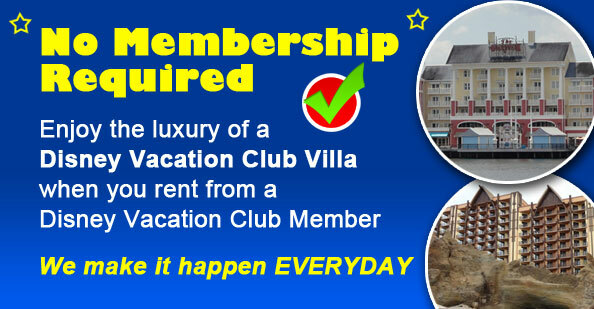 I enjoy staying at the All Star resorts because I think they are a great value for your money! Staying on property gets you all kinds of perks and this resort won’t break the bank. I also love the over the top theming, the giant characters make it so much fun. I know we will be staying here again and again. I’ve never stayed at a Value Resort before, but love that you can get all the perks of staying on-site at a lower price point. The theming looks like a lot of fun too! This is such a great overview of the All-Star Sports Resort at Disney World! That pool looks like so much fun! interestkng and holds circles of great info.